John Reischman - Photo credit, Colin Goldie. 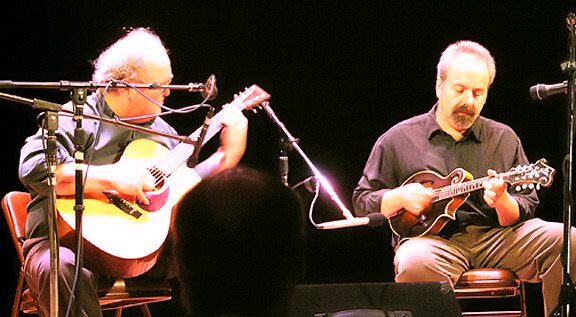 My friend Larry and I are seated next to each other at the 2004 Mandofest in Lawrence, Kansas, and John Reischman and John Miller have just launched into the opening number of their set. Tone that would be Vermont maple syrup if bottled pours out of John's 1924 Lloyd Loar signed Gibson and fills the concert hall. Larry leans over, eyes never leaving the stage, shakes his head and whispers, "he's doing it". I nod, pretty sure I understand what he's getting at. "No one has that tone. No one," he says. We drink in the wonderful sounds that follow and a set that covers parts of North and South America ends far too soon. We've just witnessed the genius that is John Reischman. 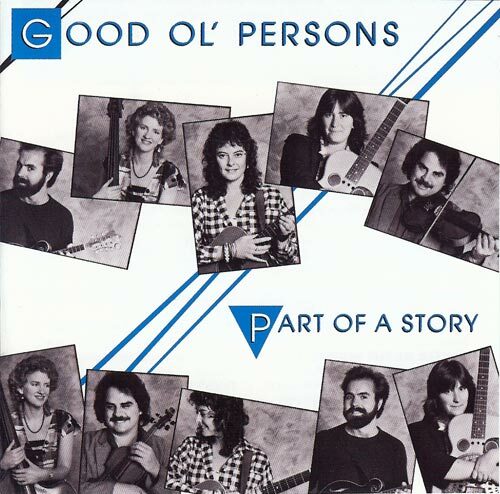 John gained instant notoriety within the acoustic music community in the mid 1980s as a result of his work with the very talented San Francisco based bluegrass band Good Ol' Persons. At a time when single-note soloing in a traditional fiddle tune style was more the norm, John's lead lines were often peppered with double-stops and chord solos. Fresh original soloing and backup, limitless creative ideas combined with a remarkably warm, rich tone, and a star was born. Others quickly took note, and in addition to his ongoing work with the Good Ol' Persons, a stint in the Tony Rice Unit soon followed. In subsequent years John has appeared on dozens of projects with artists from a wide spectrum of styles. 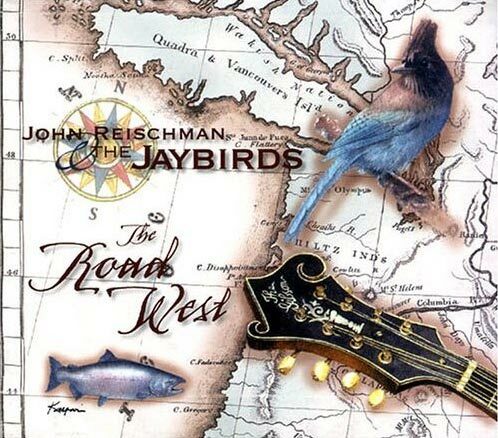 He's maintained long-term musical relationships with guitar legend John Miller, and most recently, his Juno nominated bluegrass band and main creative endeavor, John Reischman and the Jaybirds. La Arboleda, from the Good Ol' Persons recording Anywhere the Wind Blows, 1989. 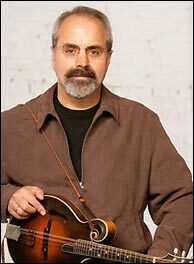 Question from Bob Gray: I've always thought that your Loar is the best sounding one I've ever heard (of course the person playing it might have something to do with that). Could you tell us the story about how you came to own this incredible instrument? Did you have any special setup work done? Who does your fret work? John Reischman and the Jaybirds' latest recording, Stellar Jays, from 2007. Click image to enlarge. John Reischman: I got the mando in July, 1981, from a music store in Oakland, Ca. It had been in someone's garage in Walnut Creek, Ca. since the fifties. I think the son of the person who owned it came across it and thought it was worth something. They took it to various music stores in the San Francisco Bay area and eventually they sold it to Leo's Music. I heard through the grapevine that there was a Loar for sale so I went to check it out. I didn't initially realize how great it was, but it was a Loar, so I decided I would try to get it. I got a loan and sold some instruments (including a 1939 D18!) to raise the money. 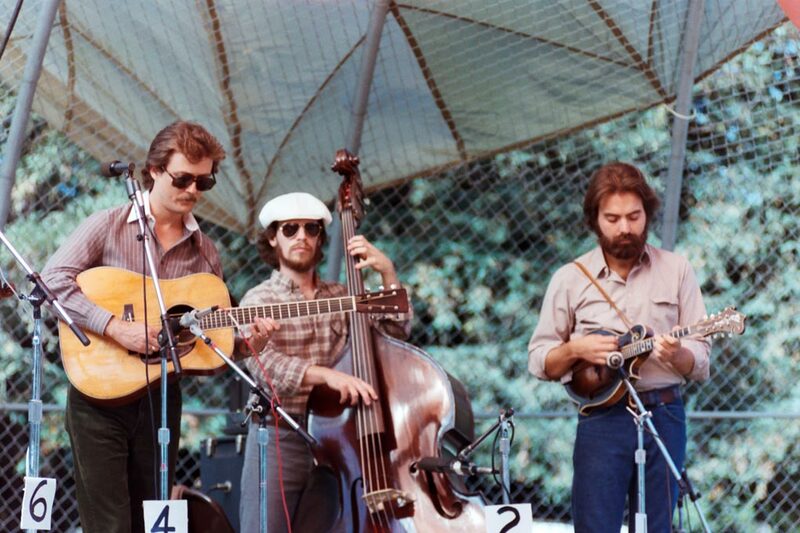 While I was trying to get the money together, David Grisman made an offer on it. It happened to be one serial number away from the Loar he owned in the sixties and had just reacquired. When he found out I was trying to get it, he didn't pursue buying it, which I thought was very cool of him. I have a picture of me the day I bought it, exchanging the check for the mando and shaking hands with the salesman. I had a radiused fingerboard put on the mando as soon as I got it. The mandolin I had prior (a wonderful Brazilian Rosewood F5 made by Stan Miller) had a radiused board that I quite liked, and when I discovered the original fingerboard noted out of tune, I had Mike McCarthy of Kamimotos shop in Oakland put a new fingerboard on it. Mike did an exceptional job. Todd Phillips modified the bottom of the bridge so that it makes full contact with the top for the length of the bridge, rather than just two feet. I'v had spot French polishing done by both Steve Gilchrist and Chris Berkov, and Waverly tuners on it for about 8 years. Michael Heiden does my fret work. I have the original fingerboard, nut, bridge top, and case, so whoever gets it when I am done with it has the option to restore it. 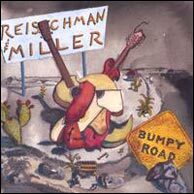 John Reischman and John Miller - Bumpy Road, 2002. Question from Mandolin Cafe: We had several questions about your distinctive tone and have combined them. We know you have a fabulous instrument, but great tone is more about the player in our opinion. Did this develop naturally, did you emulate someone early in your career or are there other steps you've taken to develop and retain the warm sound you're known for? 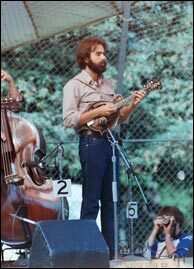 John Reischman: My early musical inspirations were Doc Watson, Norman Blake, Sam Bush and David Grisman. They all have great tone, and I guess that was part of what drew me to their playing. The notes and phrases can be exciting, but I really like to hear integrity in the tone of every note. I'm self-taught and I think I unconsciously developed the technique to achieve the tone that sounded right to me. A lot of it has to do with a pick that does not flex, and has a rounded edge. Mainly though, I think the tone comes from the hands. I believe you need a certain weight to the right hand, and the left needs to fret cleanly. I hold the pick pretty firmly, and once I grip it, I am thinking of the pick and hand as one unit. My thumb is double-jointed and that facilitates holding the pick so it strikes the string at a reverse angle. When I get a custom beveled pick, I need to get one with a left-handed bevel. Striking the string with the pick at a slight angle really cuts down on pick noise. L-R: Tony Rice, Todd Phillips, John Reischman. Photo credit, Ron Clegg. Click image to enlarge. Question from MandolinFlyer: What was your playing like before and how did it develop after your stint with the Tony Rice Unit, and what was the most beneficial thing about playing with that group? John Reischman: I think I had the basic essentials down pretty well before I started playing with Tony. That's why he hired me. The main thing that changed was that I acquired a level of confidence. I certainly practiced a lot once I was in the TRU, and as a result my technique improved. I still played with the Good Ol' Persons during my stint with Tony. When I played with them after gigging with the TRU, I felt my playing had more life and intensity to it than it had when I first joined the GOP. John Reischman with the Tony Rice Unit. Photo credit, Ron Clegg. Click image to enlarge. Tony was absolutely great to work with. He was very encouraging. Tony had very high standards and stressed the three Ts: Timing, Tuning, and Tone. If you had that together, he didn't worry too much about how you soloed. There was a lot of freedom for improvising. I had learned some jazz theory before I started playing with T.R., and being in his band gave me a vehicle to apply it. Soloing with Todd Phillips and Tony Rice playing rhythm made me play at a level I had never experienced before. Having to step up to the plate, and be on stage with such an incredible musician was a great opportunity. I felt proud to be chosen to be in his band since two of my favorite mandolin players, Sam Bush and David Grisman, had preceded me on his group recordings. Question from Perry: As you look back on your history of learning the mandolin and music in general is there any one "breakthrough" (equipment, practice technique, relaxation, etc.) that you feel contributed the most towards elevating your playing to the next level? John Reischman: I remember when I was about 16 or so, spending many hours on guitar trying to play along with a Doc Watson recording of Salt Creek, just sort of stabbing away at it, with no real knowledge of flatpicking. I knew the chords and could get some of the melody. All of a sudden I could play the tune! I was amazed. I naturally fell into the proper pick direction. I think this came from a lot of listening, and spending time with an instrument in my hands, and playing along with records (and the TV!). Question from willdawg: What's your favorite Monroe tune to play? John Reischman: It's hard to narrow it down to one. I really like Lonesome Moonlight Waltz for the tremolo. Evening Prayer Blues is great for that syncopated, bluesy downstroke style. Bluegrass Breakdown for that intense, up-tempo double-stop style. I like playing Roanoke when a fiddle player sits in with the Jaybirds and we have some twin fiddling. Question from Wesley: Are there non-string instruments or players that you listen to for inspiration or that you try to emulate? John Reischman: I used to listen to a fair amount of jazz, and I particularly liked the saxophone players. I was always intrigued with how different the players sounded from each other when they played soprano sax. It seemed to me to be the saxophone that showed the most tonal variations in a player. I saw Andy Statman recently. He is one of my favorite mandolin players, but I like his clarinet playing just as much as his mando playing. His soulfulness comes through no matter what he plays. 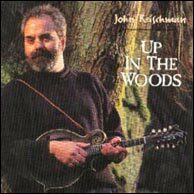 John Reischman - Up In The Woods, 1999. Bluman: You wrote the cut North Shore on the "Up in the Woods" album. Can you provide the background/inspiration for this wonderful tune? John Reischman: I wrote it soon after Bill Monroe passed away. I was thinking about him, and his legacy, and playing the mando while looking out the window facing the North Shore Mountains from my home in Vancouver. I started it one day, and finished it the next. I got the inspiration from his tunes like Lonesome Moonlight Waltz, and The One I Love Has Gone. On November 14 there will be a special Jaybirds show in Mountain View, California, marking the 10th anniversary of the release of Up in the Woods. The first set will be a regular Jaybirds set, and in the second we will perform most of the tunes from that recording. Question from JonZ: I would like to know your practice regimen at the beginner, intermediate and advanced levels of your development. Specifics about time spent on each part of your practice routines would be helpful, as well as reference to specific learning materials and exercises. John Reischman: Early on I never really thought of all the time I put in as practice. It was just incredibly fun and I was always playing mandolin or guitar. I mostly played fiddle tunes, which are great for developing basic technique. I was playing in A, D, G, and C. I also started transcribing recorded solos by mandolin players I liked. I studied lot of Sam Bush's playing from the first New Grass Revival record. This was great ear training, and a source for licks and phrases that I could apply to other songs. Later on, after I started playing in bands, I started more focused practicing. Learning repertoire, getting comfortable with unfamiliar keys like B and Bb, learning to backup vocalists, were all things I worked on. I never really timed my practice sessions. When I started playing in bands professionally I began to work with a metronome. I practiced scale patterns and right hand exercises. A lot of what I did involved working the little finger. I was starting to play jazz standards, and you need to use all your fingers to play in the closed keys with no open strings. I would choose a scale pattern that I could play with open strings, say in G, and then play the same pattern in another key, like Bb, then Eb etc. These were almost always patterns based on major scales. It was during this phase that I remember putting in at least 2 hours a day of focused practice. This was in addition to all the time I spent gigging, jamming, or just playing for fun. John Miller and John Reischman at Mandofest 2004. Photo credit, Larry Pennington. Click image to enlarge. Question from Wesley: Would you ever consider recording a straight ahead blues recording with John Miller. John Reischman: Well, John Miller is a master at the Country Blues style, and I would be honored to play that style with him, but we have developed a certain repertoire in our duo that features our common interest in Latin and jazz inspired originals, and I don't see us deviating from that too much. Never say never, though. It might be fun. We have recently started working up some material for a new duo recording. Question from gda(v)e Do you have any plan or desire to do an instructional video in the future? John Reischman: I have thought about it, and I hope to do one someday. I am currently working on a book of transcriptions from my CD "Up in the Woods". It will feature all of the melodies and some of the solos from that recording. The transcriptions were done by John McGann. I am also planning on another volume that would include my Bluegrass originals I've recorded with the Jaybirds, plus some earlier tunes like Itzbin Reel and Birdland Breakdown. I hope to have the "Woods" book completed by early 2010. Question from Tbone: One thing I notice from top-level players, and have been working on lately, is consistency in their rhythm. For instance, all the chops are the same volume. Any tips to achieving this consistency? John Reischman: Practicing with a metronome helps. When I find time to sit down to practice, I usually practice rhythm playing, along with everything else. Try chopping between the clicks and also right with them. Just focusing on rhythm playing should help with getting a consistent volume. I also think you need to make sure your right hand is moving in an eighth-note pattern, but only striking the chord on 2 and 4. Like this: 1 & 2 & 3 & 4 &. The &s are the up strokes, and the numbers the downstrokes. 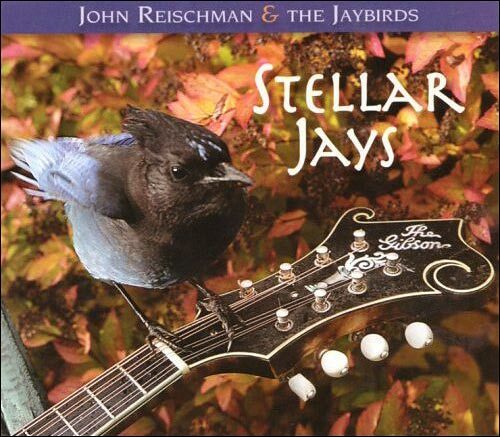 John Reischman and the Jaybirds. 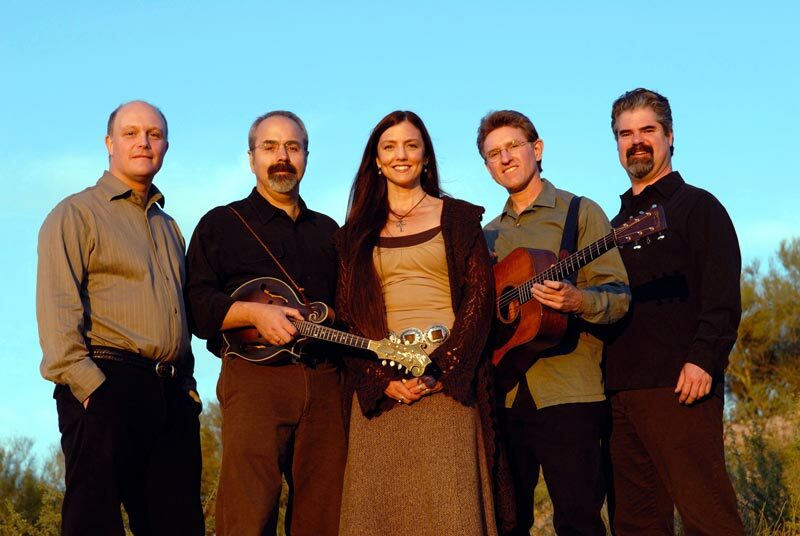 L-R: Greg Spatz, John Reischman, Trisha Gagnon, Jim Nunally, Nick Hornbuckle. Photo credit, Donna Scholl. Click image to enlarge. Question from Beargrass: It sounds like the Jaybirds are pretty widely geographically separated. Can you offer some ideas on making the most of scarce rehearsal time? John Reischman: I think recording the rehearsals and shows can be very informative. You can also send out new material in advance of the rehearsal. Usually at the beginning of a tour, The Jaybirds will run the set before the first show and that's it. On occasion we will be at a music camp together, or we will have a day off, and that's when we work up new material. Usually whoever is introducing the tune will have at least a basic arrangement in mind, and then we go from there with everyone contributing ideas. We recently had a day to work up four new tunes. Nick recorded them and sent out MP3s. We also practice the harmonies in the car when on tour. The Jaybirds are very compatible rhythmically so the basic playing is rarely a struggle. That accounts for the fact that we have had the same 5 members for almost 10 years. John Reischman and the Jaybirds, The Road West, 2005. Click image to enlarge. Question from Mike Romkey: Please talk about how you approach recording, including mics, placement and whatever general or technical details you think are important to achieving a good mandolin recording, and a good ensemble recording. And ditto for live performances. John Reischman: I like to record with the musicians all playing live, but with isolation, so that parts can be replaced if necessary. I find this preferable than adding a part at a time and using a click track. I have enjoyed playing close enough to the other musicians that you don't need to wear headphones, but usually this is not practical since you can't fix things easily because of the bleed. You could edit if you have multiple takes. I usually use a Neumann KM84 aimed at the lower f-hole. The mic usually points towards the mando at a slight angle from the right side, approximately 6 to 10 inches away. When I record with John Miller I use two mics in an x/y pattern. The mic capsules are at a right angle to each other with both pointing towards the lower F hole. Question from Potosimando: At one time, you must have practiced scales relentlessly. Was this the case, and if so, then do you still regularly practice scales? Or, at this point in your career, do you simply practice your music for the most part? Question from eightmoremiles: What other music styles do you enjoy? John Reischman: I love old time music. Dirk Powell and Bruce Molsky are a couple of my favorite contemporary old time musicians. I also like Hobart Smith. Brazilian Music is very inspiring to me. Not just Choros, but Sambas, Forro, and some of the pop music as well. It's got everything I like, Great melodies, harmonies, and rhythm! There are other kinds of music I enjoy, but I guess these two styles are the ones I listen to the most. 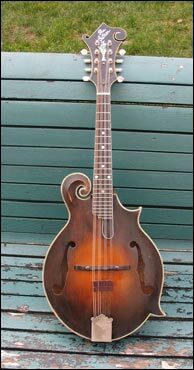 Question from mandopete: Are there any mandolin players that you enjoy listening to and why? John Reischman: I've mentioned several already. Here are a few others in no particular order: Johnny Gimble, Jethro Burns, Bill Monroe, Frank Wakefield, Chris Thile, Mike Compton. I hate to mention too many because I don't want to leave anyone out. I like Jesse Brock's playing and I was happy to see that he won the IBMA award for best mando player. Aubrey Haynie is a player I really like because he can play great in a Monroe style, but also does a fine job on the more contemporary material. 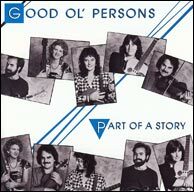 Good Ol' Persons, Part Of A Story, 1986. Click image to enlarge. Question from Dan Hoover: Is there any one song that moves you so much that you might or might not play in public, but in your own home, the one that get's you the most? John Reischman: I have thought a lot about this question, and I can't think of one that would fit your description. Sometimes when I play a tune on stage that is emotionally charged for me, I kind of zone out, and am surprised that when the tune ends I am on stage in front of an audience. Question from Nolan: What have you been listening too lately? John Reischman: I have been listening to a box set of live recordings from the Friends of Old Time Music on Smithsonian Folkways. It features folks like Dock Boggs, Mississippi John Hurt, Doc Watson, Maybelle Carter, The Stanley Brothers, and Bill Monroe (with Del McCoury on banjo!) There are some fabulous performances on it. I love Bill Monroe's rhythm playing on "I Saw The Light"! Strings and gauges: I use D'Addario J75s on my Loar. Gauges: 41, 26, 16, 11.5. On occasion I will use EXP 75s. On my Heiden I have been using J74s, gauges 40, 26, 15, and 11. Picks: I have my own model Red Bear. It is a little larger than their standard E. I believe that it is their medium thickness, roughly 1.2 mm. I think they are great! They are very similar to tortoise, but I actually like them better. To my ear they are a little darker and require less maintenance. The JR model comes in red. Remember, do not flex! Microphone preferences: In the Jaybirds we have started using DPA microphones on the instruments and going wireless. It has been working great. The model is 4061. I mount it just below the treble f-hole, suspended from underneath the pickguard. I have the transmitter attached to my Tone-Gard. We use one center vocal mic, and when we solo, we step to that mic, mainly for a visual cue, but the center mic also boosts the solo a bit. The DPA mounted in that spot can be a little dark, but having that little boost from the center mic adds a little top end. You need to play dynamically with this set up; so that the leads are loud enough, and the rhythm is not too loud. In the studio I use a Neumann KM84 or a 184. My favorite is their KM54, a tube mic. John Reischman's 1924 Gibson F5, signed by Lloyd Loar. 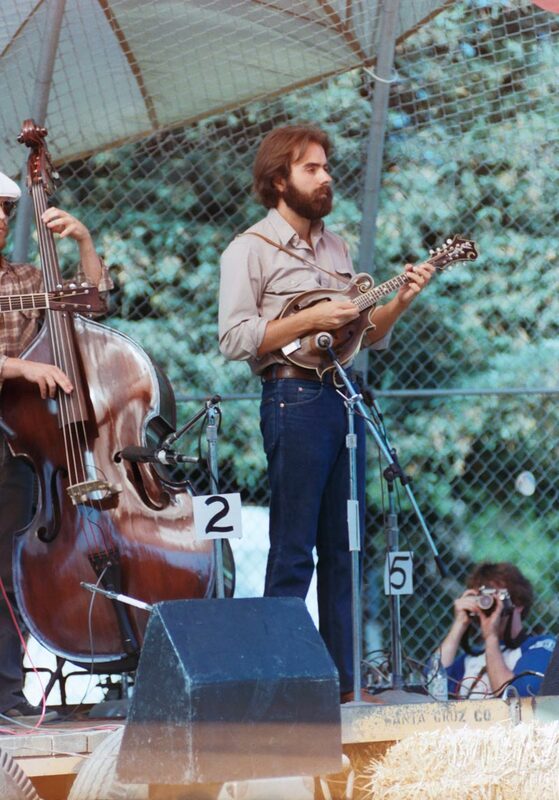 Photo credit, Dan Beimborn and the Mandolin Archive. Click to enlarge. 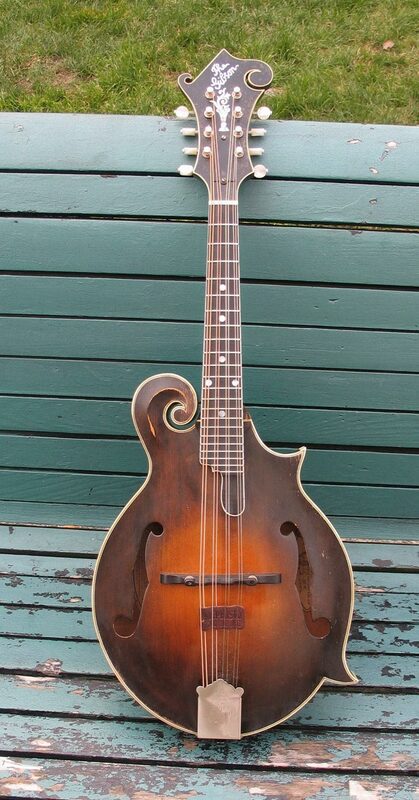 My main mandolin is a 1924 Gibson F5, signed by Lloyd Loar. I almost always perform with this mandolin. I have a Michael Heiden Heritage F that is really a great mando. I have it set up with a bit lower action and slightly lighter strings so I can play more notes faster! For me, the neck and fingerboard is perfect. Michael did a great job replicating the shape of my Loar's neck, and on my request made it a little wider. The wider neck makes chord soloing easier. It has its own unique tone—balanced, but with more overtones than my Gibson, which makes it work especially well in small ensembles. I have been performing with it in my duo with John Miller, and in a Latin trio I play in with Sal Ferreras and Celso Machado. It is one of the most beautiful mandolins I have ever seen. I just got a Red Diamond that is part of Don MacRostie's replica series. Don takes detailed measurements of an existing vintage Gibson mandolin, including top flexibility, and then makes a limited number of replicas. His most recent batch of replicas is based on my Gibson. Not long ago he did the same with a litter of copies made from David Grisman's 22 Loar. This Red Diamond mando is great. I can't say it sounds exactly like my Loar, but there are some tonal similarities. My perception is that it has a strong, focused fundamental, which works great in a Bluegrass setting. I am just judging it on its own merits rather than expecting it to be just like the Loar. It is loud, with great highs and mid-range. The bass is good, but not as deep as the Loar, but the Loar is unusually deep. It looks great too. I also have a wonderful Gibson Master Model F5 that is slightly distressed. It is also loud with a strong fundamental. The neck is a fair bit narrower than my Loar, so I don't play it on stage very often. For a mandola, I have a Lawrence Smart A shape with f-holes. It's a powerful instrument. I mostly string it with the bass strings in octaves. With this set up it makes a convincing substitute for a Puerto Rican cuatro or a tres. Works for an Irish Bouzouki sound as well. I have a very nice octave mando made by Michael Lewis. So far I have just used it in the studio. It has a Redwood top and an Oregon Myrtle (or California Laurel) back and sides. These are trees that grew around my native home in Northern California. For a round sound hole mando I have a 1921 Gibson A junior. It is pretty nice. Thanks Scott, great idea with a great result. Is there a way for the general public to order a John Reischman Red Bear Pick? Trey, I didn't know the answer to your question so I've emailed Red Bear and asked. There's a representative from there that frequents our forum so the chances are good they'll answer. What a great interview. John is such fantastic musician, tone monster and genuine guy and what a great web-site. That picture (in the interview) of Mandofest sure brings back great memories! My nephew and I were lucky and got to drive John Reischman and John Miller back to airport after the conclusion of Mandofest and you won't meet two nicer guys. As I was dropping them off at the gate, John R gave me about fifty pages of music to work on based on our conversation en route to the airport. We are all so fortunate to have the Mandolin Cafe and hats off to Scott for all his efforts. I'm in a dead heat with John over his transcribing of "Up in the Woods"...he told me about it at Blueberry back on August 2, and I'm 4 tunes in. My faves so far are the title track and "Eighth of February"...now, to just get that TONE. Very good interview Scott,thank's for doing this,and thank you John Reischman for your time..very informative...looking forward to more. "What a great interview. John is such fantastic musician, tone monster and genuine guy and what a great web-site." ditto Thank's again Scott. Extremely cool project and good info! Great project and good info. Enjoyed it very much. It's cool to learn that John is an old-time music fan. It certainly comes through in his playing. And that mandolin collection......nice!! Thanks for the work put into this Scott. I'm looking forward to the rest of the series! Thanks for this, Scott. I really enjoyed it, and would love to see more of this type of thing. I am pleased to see John's interview and the response it has garnered. Very cool! John certainly is one of my favorite mandolin players. I love the tone he gets from his Loar. Regarding his pick, it is a slightly oversized style "E" in medium gauge, no grips, and a left hand bevel. He always orders in the Red Jasper color. These picks are easily obtainable from us - simply purchase a style "E" in medium with left-hand bevels and the red color and then note that you want the "John Reischman version" when you order. You may or may not want the left-hand bevel. Please make sure you know which bevel to get, if any. If you have any questions, please email or call and we'll be happy to get you straightened out. In short, if you tilt your picking hand toward the headstock when you play, then you need a Right-Hand bevel. If you tilt your hand back so that on the downstroke, the bridge side of the pick hits first, then you need a Left-Hand bevel. If you hit flat on the strings ala Andy Statman, then you need no bevel, which is what we refer to as a "Standard Bevel". I hope this helps. Again, please email or call if you need more. We're always happy to oblige. Thanks Scott. I really enjoyed the interview and look forward to your next project. Looking forward to seeing John in concert in about 3 weeks, maybe I'll have some follow up questions for him. Thanks Scott, fantastic interview! Can't wait to get home to practice. Hope to see more of the same great stuff coming in the near future. This site is unbeatable! Nothing compares. Great interview! Thanks so much. More, please! Great interview! Thanks Scott and John. Well, John R. is self-taught, never spent too much time on scales, was unafraid to put a radiused board on a Loar, and chooses Red Bear picks! Heard from the horse's mouth right here on the cafe! Personally,i can't wait for the 'Up In The Woods' transcriptions,especially as it will contain "The Eight of February",a tune which i've got down around 90% accurately,but i'd sure like to get to grips with the other 10%. I hope we'll be well notified when the transcriptions are available. Many thanks for this Scott,great to hear from one of my 2 favourite players & i'm still hoping that he may be teaching at next year's Sore Fingers Summer School in the UK. Noting the anniversary of this interview with John, one of the Cafe's very earliest. Observing the anniversary of one of our earliest feature interviews.